With Focus Fusion Society everyone has the opportunity to participate in the search for effective clean, green alternative energy. Anyone can help back the most efficient production of huge amounts of energy from very small amounts of fuel. Also with a power unit that could be located anywhere close to population centers, totally scalable from the smallest communities to the largest conurbations and cities. Not only that but also providing the cheapest possible energy around with a miniscule establishment cost, putting it within the reach of any country in the world. Built to act as an education and discussion vehicle Focus Fusion Inc can also channel your money to fusion research. Doing so as a charitable donation through its 501(C)(3) tax-exempt status. Here is a great way to see change happen, and fast. Money donated goes straight to research into dense focus fusion. The funds needed to see this succeed are quite small in comparison to many other projects out there. If you are not sure of the viability of this, they offer a wealth of background information and images. There is in depth detail on dense plasma focus fusion as well as a great number of other projects. Questions can be answered by team members well connected with actual projects. There are forums to explore a large number of aspects in nuclear fusion research and directions. Up to the minute news is available on dense plasma focus fusion. You can come in as a guest to learn more and observe. Or you can join and become a member of the Focus Fusion Society, lending your impetus to see real change happen. A number of nuclear fusion reactions allow energy to be produced without dangerous neutron by-products. Neutrons tend to generate radioactive materials as well as requiring dense shielding for safety. 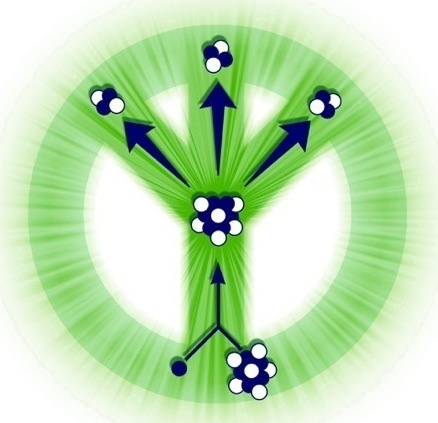 The particular aneutronic fusion reaction Focus Fusion backs is that involving the fusion of the proton of a hydrogen nucleus with a boron nucleus. Both reagents are readily available. 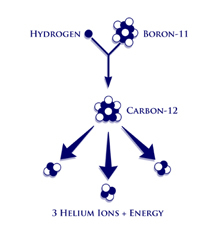 The result of the fusion is the intermediate production of a carbon nucleus, breaking down almost immediately to three helium nuclei - or alpha particles as they are known. 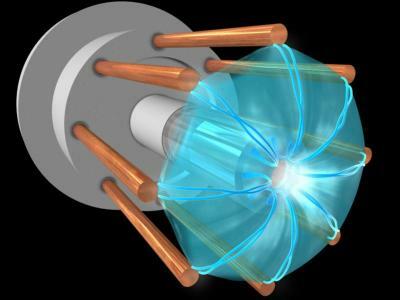 The project most strongly backed by the Focus Fusion Society is LPPX - the Lawrenceville Plasma Physics Experiment with its dense plasma focus unit. LPPX has already produced record temperatures in its experiments. Enough to allow for fusion with hydrogen and boron. Its method leverages on the well-known instabilities present in trying to create plasmas. The units required to initiate the fusion reaction are actually quite small and relatively cheap to produce. There are a few details yet to be ironed out for a fully working model. One great benefit of the method is that there is no requirement to harness heat to boil water or another liquid to drive turbines. Using turbines involves extra cost, size and results in inefficiencies with loss of a significant proportion of the generated energy. By using the charged ions - the nuclei - that are repelled by the negatively charged electrons, also in the plasma, within a coil the generated magnetic fields of the charged ions directly produce an electric current. Individual units can be added one to another to scale energy production according to need. Not much more is required to produce success for the LPPX project. Focus Fusion Society allows people from all over the world to contribute a little bit each so that all the world could benefit from this dramatically cheaper, safer and cleaner power source. 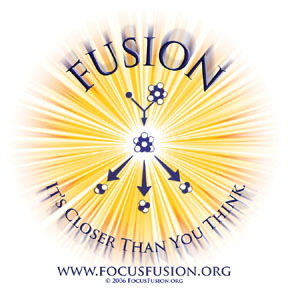 Many people involved in other aneutronic fusion projects also connect with and relate to the Focus Fusion Society. A wealth of information is available on the Focus Fusion website about these other projects. Its aim is to educate and disseminate as much information as possible about nuclear fusion. Mostly it is wealthy investors or national and trans-national governments who can contribute to these projects. Now with Focus Fusion Inc a large number of regular people from all walks of society and throughout the world have the opportunity to step up to see change happen. When we saw the huge, almost unbelievable changes that occurred around 1989 leading to the fall of the iron curtain, and more recently in the arab spring, change came about through many people joining in supporting each other. Why not see that happen for you and the people about you? Join or contribute to Focus Fusion Society. Spread the world to create a groundswell for change. Cheap, clean, green alternative energy has now become simply a choice away!